While grilling outdoors, sweating in front of the blazing heat for hours often take a toll on us. The very thought of cooking a side-dish after that do sound like a nightmare during such occasions. But why would you go through all the hassles of cooking again when you can whip up a fresh salad without going near the fire even once? Choose from the seasonal fresh produce and toss them up into a crunchy salad for your cookouts. Caprese salad, an Italian tomato salad, fits the bill perfectly. The flavorsome combination of tomatoes, cheese and basil, spiked up with balsamic-olive oil dressing, is light, healthy and gives great company to the protein-packed meals. And guess what? You can play the ingredients as well as the proportions to suit your palate and throw in yummy add-ons to pep things up further. Though this tomato salad is easy to pull off, but it calls for fresh, best quality ingredients to shine. So make a point to go for the ripest, juicy tomatoes from the farmer’s market, fresh green basil leaves and good-quality, fresh mozzarella for this Italian summer salad. With the perfect ingredients within reach, it simply can’t go wrong! No wonder, this colorful medley is bound to woo its takers with its elegant looks and flavors. •	Lay out the tomato slices onto a large platter. 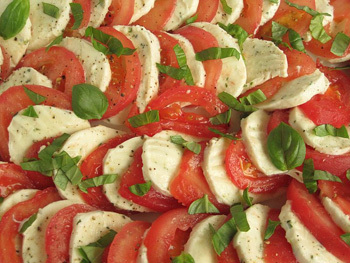 •	Place the mozzarella slices on top so that they overlap the tomatoes partially. •	Sprinkle the chopped basil on top and drizzle the olive oil over them. •	Finish it off with a splash of balsamic vinegar and serve immediately.